You can now choose the country from which a scrape is executed from. At the moment the choices are the US or UK. You can now choose if you respect the robots.txt rules or not. By default, a scrape does. Relative data can now be automatically associated together, this is useful when you have data that is present against some HTML elements but not others. By associating those items together, the values will appear against the correct items of data in the resultant dataset. When creating a dataset different columns can belong to different templates, meaning that some columns can be populated from one type of page, and other columns from different types of page. One example of this would be a product listing page and a product detail page. This would allow you to get the broad details from the listing page and then the detailed information from the product detail page. Another way the dataset builder has been improved is to allow the effects of an operation, such as a contains, less than etc to be applied to all or some columns. 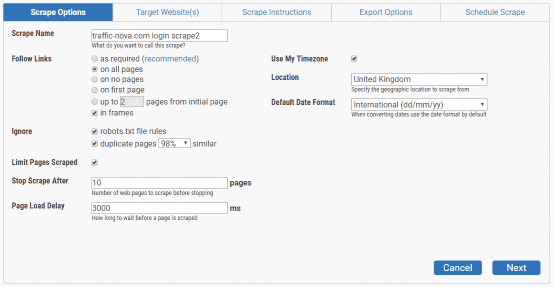 There are now several new commands available from the scrape wizard. Delete – you can now delete elements, which is useful in some circumstances to stop the same elements being read multiple times. Scrolling – the web scraper can now scroll HTML elements that support it. Hover – this command will hover the mouse above a specified element, which can be useful in revealing information. Pagination – this is a new feature for the Click action and allows pagination to be automatically performed on selected pagination links. This means that even if the scraper clicks off of somewhere in the paginated data, as part of the scrape, it will find its way back to the current paginated page to continue on with the scrape. The best part about GrabzIt's Web Scraper is that you can get free use of it every month. So what are you waiting for give it a go and please give us back any feedback you have we would love to make ours the best online web scraper!